These premium cassettes feature a flow-thru design for the optimization of biopsy processing and embedding. Multichamber cassettes have the same construction and design features but are divided into four separate chambers for multiple processing. They are not compatible with most printers. Two-piece biopsy cassettes include the same construction and design features as standard cassettes, but are supplied with unattached covers. They are also available in pre-filled tubes for printers. Ultra small pore biopsy cassettes eliminate the need for sponges, bags, biopsy papers, and screens by incorporating a significantly smaller pore size (0.25mm) into the cassette design. These cassettes are also available in pre-filled tubes for printers. 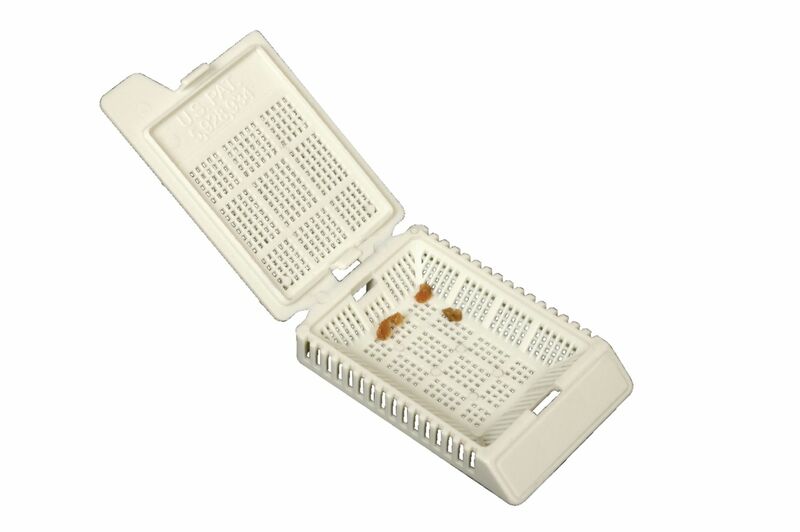 Unique patented 135° side wall inner basket provides the optimal handling of small specimens. Small pore design (0.67mm pore size) offers a more effective fluid exchange when compared to sponges, screens, and bags. Standard 45° print surface is compatible with automatic printing devices. Items with attached covers have a large labeling area and utilize a built-in frangible hinge. Molded of reagent-resistant acetyl polymer resin for chemical resistance to histological solvents. Ordering information: Biopsy, two-piece biopsy, multichamber, ultra small pore, and mini biopsy cassettes are designed to be used with VWR® base molds (see 18000-116 series), sold separately. For additional information on printer-ready Biopsy Cassettes packaged in pre-filled tubes, see 95029-970 series. Additional accessory items are available for processing, microtomy, and storage. Contact your VWR representative for additional information.